Friuli – a historical region in northern Italy (north-east). 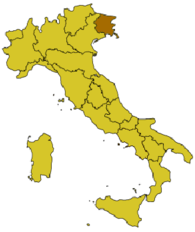 Friuli – now a part of the total in the region of Friuli-Venezia Giulia, which borders with Austria and Slovenia. Mountains cover more than 40% of the territory of Friuli; they are quite high, so the vineyards are located below, closer to the coast. Many of them were stretched on the hills that contributes to good grape ripening. The climate of Friuli – a moderate, characterized by high humidity. Mountains serve as a natural protection from the cold northern winds, however, thanks to the vast plains of the Po Valley, is there a sufficient circulation of air masses. Area vineyards of Friuli is not too large, and the volume of production of wine. Friuli region is known mainly for its white wines, but it also produces red and good quality. A special merit of local winemakers is their desire to use the most modern production methods using the latest equipment and technology innovation; Another distinctive point – this is a very low yield, which allows to achieve high quality for the majority of local wines. In the vineyards of Friuli as the native varieties are cultivated and international – Chardonnay, Muller-Thurgau, Pinot Bianco, Pinot Grigio, Sauvignon Blanc, Gewurztraminer, Riesling, Cabernet Sauvignon, Cabernet Franc, Merlot, Pinot Nero, etc. The wines of this region will approach those people who love odnosortovye wine of excellent quality. Kitchen Friuli Perhaps the most famous product of the region – jerked ham San Daniele, it can compete with the famous Parma ham. There is also producing cheese Montasio. In the kitchen, Friuli (Friuli-Venezia Giulia), as well as the neighboring Venice lot of corn, beans, potatoes, vegetables, pork, venison. On the culinary traditions of the region was influenced by the Austro-Hungarian Empire: food flavored with poppy seeds, zira, anise … From the main dishes of this area are: Vegetable soup with beans; Rice soup in Friulian (cooked on meat broth); Chicken in Friulian (cooked with porcini mushrooms and white wine); Fagioli con cotechino – beans with sausage; Polenta pasticciata ai gamberi – Polenta with shrimp (Italian dish of cornmeal porridge resembles or hominy); Prosciutto e fichi – ham with figs; Risotto alla maranese – risotto with seafood; Spezzatino d’agnello – lamb stew; Presniz – Snails from the test; Gnocchi di patate alla friulana – Njoki (klëtski) potatoes with fruit and chocolate.